Shaggy, while doing an interview to promote their new 44/876 album, with Sting, on BBC Radio 1Extra spoke about his childhood growing up in Jamaica. TESSANNE CHIN win’s NBC’s The Voice representing Jamaica well with Excellence, Quality, and Humility. Tessanne Chin made history Tuesday night December 17 when she became the first Jamaican and the 2nd Caribbean person (Melanie Ann Amaro whose parents were from the British Virgin Island won X-Factor in 2011) to win a USA mainstream singing talent competition by winning NBC’s The Voice. Not only did she make history in that regard but also some of the activity that was occurring around her appearances on the Voice. 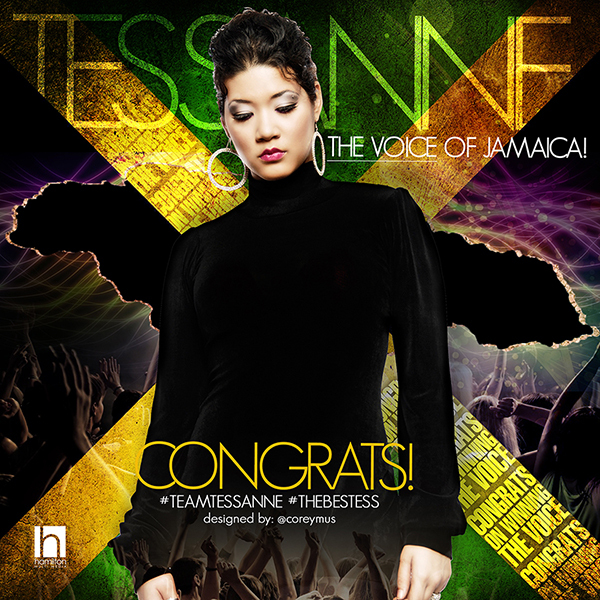 For several weeks Jamaicans in Jamaica and around the world along with Caribbean people mobilized to support Tessanne in her bid to win the reality show competition. The feeling that was created for Jamaicans everywhere mirrored the emotions that Jamaicans felt when Jamaica’s Football team the Reggae Boyz had qualified for the finals of the World Cup in France in 1998, the Success of the 2008 Track and field Olympic team in Beijing, and Jody-Ann Maxwell becoming the first non-American to win the Spelling Bee Competition at age 12 (1998) to name a few memorable events. All these events including Tessanne’s victory had Jamaica on display showing Jamaicans in a very positive light and united Jamaicans. Jamaicans behaved in a manner that demonstrated that they felt all the aforementioned achievers were a part of their extended family. Tessanne’s victory had all the characteristics of all the previous historic moments but this moment had an added and very engaging feature and that was the high level of interaction that Jamaicans had with Tessanne being on The Voice. In order to win the contestant had to not only win over the judges perspective of their talent but also had to then convince those watching to vote for them as the best and to buy the songs that were performed each week. The votes and sales would establish the winner of the competition. Jamaicans, Caribbean people and those who love Jamaica spread the word, mobilized and got people involved to vote and buy songs. It started out slow as in the beginning her sales were not that strong and one week she was in the lower end and had to be saved to be kept in the competition. Eventually, especially after singing “Many Rivers To Cross” by Jimmy Cliff, Tessanne began to surge ahead with voting and sales of her songs on Itunes. Jamaicans, Caribbean people and her supporters were hitting social media heavily, hosting watch parties in cities throughout the Jamaican Diaspora and they were encouraging people to buy her music. The fact that votes and purchases from outside the United States did not count did not deter Jamaicans in Jamaica and the non-US Diaspora as they mobilized family and friends in the US and kept up the powerful social media campaigns. The groundswell of the grassroots mobilization led to Tessanne being featured in main stream outlets in the US which led to creating new fans and more support. The timing and choice of songs by celebrity coach Adam Levine and of course Tessanne’s powerful voice with an amazing vocal range once heard enthralled large crowds of new fans. The last two songs went to number one on the I-Tunes chart and since sales of each song in the top ten represented 5 votes these songs helped her surge ahead. Throughout the competition not only was her heavenly voice on display but her humility and loving spirit. Tessanne the daughter of two musicians and the younger sister of a very popular artist in Jamaica (Tami Chynn) had not enjoyed major success since she began her career. The Chins had moved to England when she was younger (she is now 28) and at around 16 she returned to Jamaica. The audience would learn she was always singing and once she arrived in Jamaica she tried to make a career of it. Tessanne would come to focus on a fusion of Reggae and Rock and created a small cult following for this. All would agree that her voice was majestic, one of the best in Jamaica, even the Caribbean. There were comparisons to a young Aretha Franklin and more. However there was not much Commercial success. She would be chosen by Reggae Legend Jimmy Cliff to back him on tours and eventually by Shaggy to collaborate on several projects that he was doing. In all these areas her voice shined. So it was probably a no brainer when Shaggy, who had signed Tessanne to his new label Ranch Entertainment, had lobbied for Tessanne to be on the Voice, and the timing could not have been better since Tessanne was beginning to have doubts about the economic sustainability of her career. Tessannes performance will now go down in the annals of Jamaican music history, according to the host of the show the amount of voting and sales of songs were at record levels. The winner gets a record deal and of course instant fame. Tessanne performed at the highest level and won, she did this while showing great humility and poise and inspired a movement of mobilization that could be compared to the 2008 mobilization that helped President Barack Obama win his 1st Presidential election.